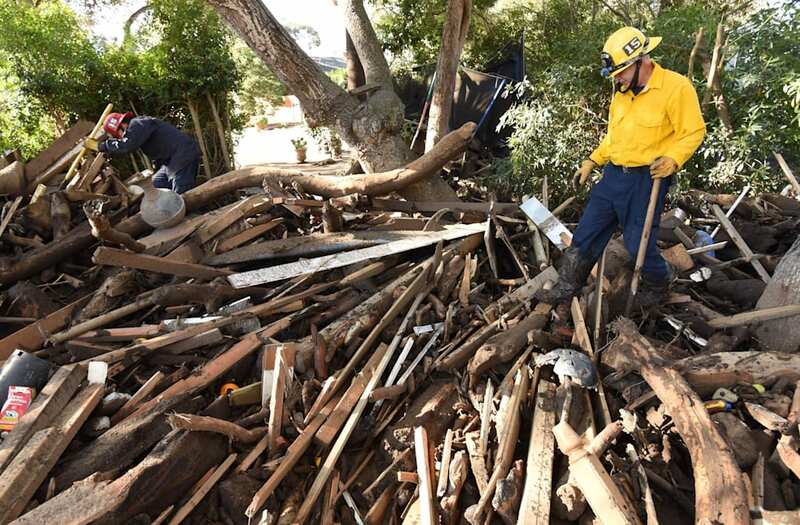 Santa Barbara officials have warned that they need to clear debris from drainage basins and channels following this week’s deadly mudslides or risk possible further mudflows if another storm hits Southern California. Rob Lewin, director of the Santa Barbara County Emergency Management Officials, told a press conference Saturday that the blocked drainage channels in the Montecito area of the county meant that even if a storm of "less intensity" hit, the area could see "more mud and flow." The warning came as the Santa Barbara County Sheriff's Office announced that the death toll in Tuesday's mudslides had risen to 19 after 25-year-old Morgan Christine Corey was identified as among the dead. Five others remain missing after mudslides occurred after a heavy downpour struck areas burned by the so-called Thomas Fire that scorched hillsides last month, the county sheriff's office said. Four children aged 3, 6, 10 and 12 are among the dead. The mudslides left drainage basins and channels clogged with debris, officials explained. A section of Highway 101 — which runs north-south through the states of California, Oregon and Washington — also remains closed indefinitely due to the high-levels of water on the road surface, according to California's Department of Transportation. “We have got to get those basins cleared as fast as we can,” Rob Lewin, director of the Santa Barbara County Emergency Management Officials told a press conference Saturday. Lewin said clearing the debris was his team's number one priority to mitigate the risk of another mudslide. He added that a task force was working on locating places where they could safely move the debris. “We have got to get those channels ready or we’re going to have more mud and flow under a storm that would be of less intensity,” he said. The seven-day forecast for the Montecito area has no storm warnings and is largely dry with a small chance for light rain on Friday, according to the Weather Channel. As for Highway 101, Jim Shivers a representative from the California Department of Transportation said he could not tell members of the public when the road would reopen due to the "massive amount of water on the highway." Shivers added that while he did not yet have a time or date for when the road would be reopened, it would reopen at some point. "Once we can get that water to recede we feel very confident that we can bring in the available equipment on standby get down to the bottom and move the heavy material out of the way," he said.